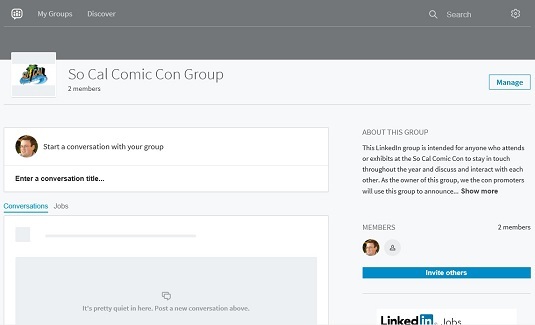 The core of LinkedIn Groups is to start and maintain conversations among group members that aid in sharing content and job postings, making business or professional connections, finding answers, and establishing industry experts. Like the conversation. By clicking the Like link, you are signaling that you found the post useful. Some group members may assess whether to participate in any given discussion based on the amount of Likes that the discussion has received. Comment on the conversation. By clicking the Comment link and adding a comment to the discussion thread, you unlock the true power of group conversations by adding your own viewpoint, replying to the original point, or replying to an existing comment. Reply privately to the group member. When you read a conversation or another comment from a fellow group member, you can simply click the three dots (…) next to the conversation or below the comment to bring up a short menu, and then click Reply Privately. This generates a LinkedIn message you can use to communicate with the group member directly, without the group viewing your communication. Perhaps you want to offer individualized help or use this as a form of lead generation. Report the post or comment. If you’re interested in keeping the group as spam-free as possible, you can click the three dots (…) either at the top of the conversation post or below any individual comment, and then click the Report link to report the post or comment as inappropriate. Once you do that, the group administrator will be notified and can review the item for further action. After you join a group, it’s recommended in the beginning to understand the dynamics of how the group operates, so start by participating in existing discussions and then decide how you can best contribute with your own posts. From the top navigation bar, hover your mouse over the Interests link and then click the Groups link in the drop-down list that appears. From your Groups page, click the My Groups link to bring up a page of groups you manage or are a member of. From that page, click the name of the group to bring up that group page. Start a conversation in your LinkedIn Group. Click the Enter a Conversation Title section. Once the cursor appears (and that text disappears), start writing your headline. Here is where you summarize what your post/conversation is about, so write an informative but succinct headline that lets people know what you plan to ask or share. Many people ask a question or include a viewpoint in their headline in order to invite people to comment on the conversation and indicate that you want a real discussion and are not making a fluff announcement. Click the Add Some Details or Use @ to Mention section. When the cursor appears, start writing the content of your post in the box. If you want to pull someone into the conversation, type the @ symbol in the text box and you will see a prompted list of first-degree connections as you type their name. They will be flagged, regardless of whether they are already in the group, and will see this conversation and be able to contribute. Tag people to include them in the discussion. If you are linking to an article or post as part of your discussion, enter the URL for that item in the details section. LinkedIn automatically formats the conversation so people will see a summary of that item in the conversation, and can click that summary to see the rest of the article or post. (Optional) Use the icon to insert a photo or image into the conversation. In the bottom left corner of the conversation box, there is a graphic representing an image. When you click that graphic, LinkedIn opens a window on your computer, allowing you to select an image file from your computer to upload to the conversation post. You should only upload graphics that will add to the discussion or be useful visual content for the conversation. Click the blue Post button to start the conversation in the group. That’s it! Your newly created post will automatically show up at the top of the Conversations tab for the group. Other group members can then click the Like button underneath the conversation or click the Comment link and participate in the discussion, similar to other social media sites. While all conversations are automatically posted, group administrators retain the power to remove any post they consider spam, offensive, or counter-productive to the purpose of the group. Additionally, any group member can report a post and that post is temporarily hidden while the group administrator reviews the report to see if that post should continue or be removed.